Who would’ve thought that the competition between the WWF and WCW on the video game consoles extended all the way back to the ’80s? Well, it’s true. 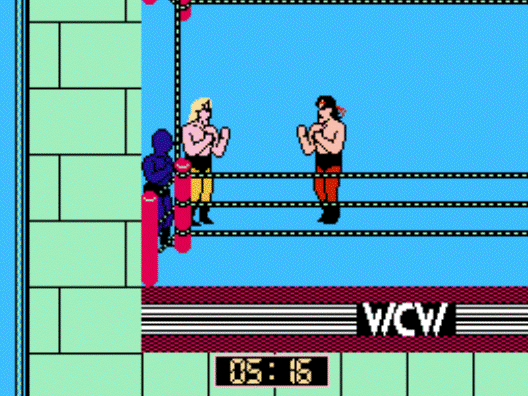 Long before The Monday Night Wars saw WCW and WWF compete for supremacy both on TV and on the home consoles, WCW took their first crack at making a licensed video game in the 8-bit era with WCW World Championship Wrestling. 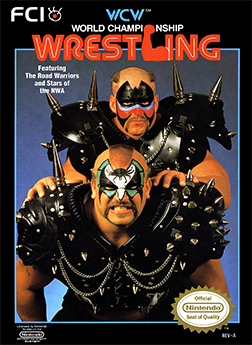 As you would expect, the WWF had beaten them to this form of media, releasing their first game, WWF WrestleMania, on the NES the year prior. But…yeah. It had issues. WCW then stepped up to see if they could offer something better. The former Jim Crockett Promotions (JCP) had recently been purchased by Ted Turner, and though the company was struggling for direction in the face of the WWF’s mainstream dominance, they still had an amazing roster of talent, and the backing of the Turner media empire promised new possibilities for reaching a broader audience. Perhaps this could translate into success on the consoles. But could WCW pull it off? With the exception of the classic Pro Wrestling, wrestling hadn’t really translated well onto the NES, and expectations were low. Would WCW succeed where the mighty WWF had thus far stumbled? This game comes to you developed by Japanese video game manufacturer Nihon Bussan, who created this game as the American port of their Japanese release Super Star Pro Wrestling, a Famicom game starring puroresu legends like Antonio Inoki, Giant Baba, Stan Hansen, Vader and others. As soon as you get to the title screen and hear an 8-bit announcer proclaim the promotion’s name, you choose your match: Singles or tag team. Very basic, but decent for a game of this time period. You then get to choose your wrestler. Fans of old-school rasslin’ will be pleased to know that the game’s roster contains an impressive selection of ten ’80s NWA stars for you to take to the ring. You have Ric Flair, Sting, Ricky “The Dragon” Steamboat, the Road Warriors, Lex Luger, Kevin Sullivan, Rick Steiner, “Hot Stuff” Eddie Gilbert, Michael Hayes, “Dr. Death” Steve Williams and Mike Rotunda. It’s a good roster of famous names who, with a few exceptions, you rarely ever get the chance to see in wrestling games. Okay, so it has a nice roster, but does that really make much of a difference once the in-ring action starts? Yes and no. On one hand, all the wrestlers have essentially the same strength, speed and basic moves. However, on the other hand, Nihon Bussan actually inserted a degree of wrestling variety in the game. It’s a fact that, however much we loved playing it, the NES always had limitations to what it can do, making it difficult to have an interesting variety of possible actions. In wrestling games, this often translated to extremely limited, boring movesets. However, Nihon Bussan worked around this obstacle in a pretty clever way. Each individual wrestler has a list of eight possible grapple moves, and though the move lists are fairly similar to each other, the combinations are different. Before each match, you are given this list, and you have to choose four of them to have with you during the match, each of them executed by pressing a different direction on the D-pad during a grapple. It’s a surprisingly creative way to add more variety to the in-ring action and have distinct matches. It also brings up a bit of a strategy element, as you decide whether you want to go into a match prepared to execute power moves like piledrivers and atomic drops, go the submission route with Boston Crabs and the abdominal stretch, or a combination therein. On top of that, World Championship Wrestling actually pulls off something that the WWF never managed to accomplish despite all the NES games it put out: Finishing maneuvers! 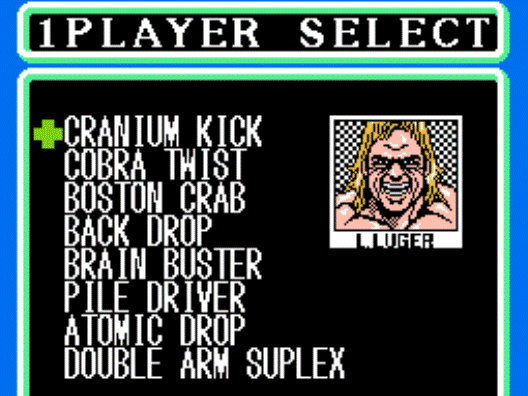 Now, not all of them are true to real life; just to name one major example, Ric Flair won’t be able to lock in the Figure Four in this game, but instead finishes off opponents with a “jumping neck breaker drop.” But Sting has the scorpion death lock, Dr. Death has the Oklahoma stampede, and Steamboat has the flying body press. And even if the wrestler’s finishers aren’t completely true-to-life, the fact that the game makes the effort to include that element of wrestling is impressive. Furthermore, they add to the drama of the match; you only get to bust finishing moves out towards the end, when your opponent has been beaten up sufficiently. But even then, they’re not a guarantee of immediate victory for you, and if your opponent hits theirs on you, it’s not over until it’s over. A finishing move can still mean that you or your opponent can manage to kick out at a 2.9 count, requiring a little bit more punishment before either of you are put away for a 3 count. You can find yourself having some surprisingly dramatic near-falls and sudden finishes on this simple little 8-bit game. The gameplay is fast-paced, challenging and requires a bit of getting used to. The AI pulls no punches, and you’ll need to focus and keep on your toes to have any hope of staying on the offensive. This is one part where the game has room for improvement: It moves at a breakneck speed and shows no mercy to newcomers. Expect some frustration when you’re first starting out with the game, because if you’re not constantly moving and charging forward on the attack, the AI opponents can be pretty cheap and turn things into a squash match. Once you get used to staying on the offensive and constantly shin-kicking your opponent into submission (silly-looking, I know), you can eventually get the hang of it, but it still won’t be easy. The single-player mode sees you square off against opponents as you build up a record of wins, losses and draws. As you progress and rack up wins, make sure you have a pen and paper handy, because you’ll receive passwords to mark how far you’ve gotten, if you need to turn off the game and come back later (yes, passwords. That’s how we saved our games back in the day, you young whippersnappers). Once you rack up about 20 wins, you’ll go on to face the game’s final boss for the championship: The WCW Master, an enormous, masked, Andre The Giant-like brute who you’ll absolutely need quite a few tries to eventually take down (Andre himself is actually the final boss in the Japanese version). It’s how most NES games were at the time: Difficult, at times supremely aggravating, but once you finally take down that last boss and win the title, you have an awesome feeling of accomplishment. It’s a shame, really. The WWF got repeated chances to try to prove themselves on the NES, only to trot out a series of mediocre titles that don’t hold up. Meanwhile, WCW managed to bring us a surprisingly innovative and engaging wrestling game, years ahead of its time. And yet, not many people knew about it then or know about it today, and the company wouldn’t make another game for years. It imitates life, in a way: For years, WCW possessed amazing wrestling talent and, in terms of in-ring performance, was often superior to what we got from the WWF. But due to a lack of stable leadership, aimless direction and the fact that they didn’t have Vince McMahon’s marketing acumen, they struggled to parlay their qualities into mainstream success, and remained a distant second to the WWF juggernaut. It’s unfortunate that things turned out that way, because WCW World Championship Wrestling deserved, and still deserves, recognition. While other wrestling games of the ’80s and early ’90s tended to be ponderous and uninteresting, this game really put in the effort to be a fast, action-packed experience. If you can, seek this one out and give it a chance, because you’d be surprised by how far it goes for an 8-bit game faced with the limitations of its time, and once you get used to the difficulty, there are some good times to be had.